Male and female Macropharyngodon bipartitus in the author’s aquarium. The Blue Star Leopard Wrasse, also referred to as the Divided Wrasse, Vermiculite Wrasse (as well as a few other common names) is one of thirteen species of leopard wrasse in the Macropharyngodon genus. 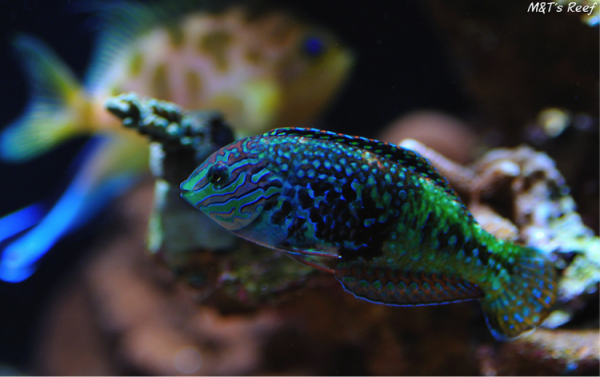 As with most leopard wrasses, Macropharyngodon bipartitus is sexually dichromatic (males and females differ in coloration). Interestingly, all leopard wrasses are protogynous hermaphrodites, meaning they begin life as females and have the ability to change to males as a result of maturation and certain criteria within the dominance hierarchy. The female M. bipartitus presents a very striking mix of colors and patterns that consist of a yellow to green mouth and head, a primarily reddish orange body, orange to yellow fins and a contrasting blue/black coloration on and around the abdomen area. Complex markings in pearlescent white, orange, and light blue make this an attractive and distinctive-looking fish. The male is equally striking in his own right with a brown-to-red body that sports intricate vibrant green and blue broken stripes and blotches that are outlined in black from mouth to tail. The M. bipartitus (female shown) natural diet is almost exclusively shelled protozoa and small snails. Maximum Size: Approx. 5 in. In the wild, M. bipartitus can be found in the Western Indian Ocean to Maldives where it inhabits lagoon and sheltered seaward reefs up to 98 ft. (30 m) deep. Juveniles and females form small groups (harems) with a mature male nearby. Their diet consists almost exclusively of foraminiferans (shelled protozoa) and small snails that they pick from the substrate. Cover the tank. All wrasses, no matter the genera or species, are jumpers and it is absolutely essential for their protection that the aquarium be covered. The best solution for this is to use 1/4-in., clear-net screen. This material has negligible impact on light penetration and the holes are small enough that fish cannot pass through. The screen can be purchased by itself or in a complete DIY kit from Bulk Reef Supply (BRS) and will work with rimmed and rimless aquariums. Choose peaceful community tank mates. Provide multiple daily feedings. Wrasses are very active fish that require meaty foods three or more times throughout the day. Provide sufficient cover. To reduce stress, wrasses need rock work with caves and hiding places. This is especially important when keeping multiple wrasses, whether they are of the same or different genus or species. An established aquarium. Leopard wrasses hunt for live food throughout the day. Provide them with established live rock that is well-stocked with copepods and other small crustaceans. A sandy substrate. A sand bed of at least 2 in. is necessary for them to bury themselves at night while sleeping. These wrasses are also known to dive under the sand for protection when they feel threatened. This is an M. bipartitus that is transitioning to male. Recent improvements in collection practices in certain areas have made it much easier to obtain a healthy M. bipartitus than it has been in years past. That being said, they can be delicate shippers and not all collectors follow the same practices. Females tend to handle the stress of collection and shipping better than adult males. When choosing a specimen from a local fish store, take a close look at the fish and ensure that the mouth is not damaged, the eyes are clear, the fish is not thin, there is no damage to the body or fins, and that breathing is normal. Observe its behavior; look for head shaking, twitching, and flashing against rocks or substrate which are signs of external parasites. Finally, determine whether the fish is eating prepared foods and ensure that it is swallowing the food and not spitting it out. Ordering online from a reputable retailer is another option, but you lose the opportunity to observe the fish for signs of damage/disease or to see whether it is eating prepared foods. Another thing to consider with an online purchase is that guarantees are limited to live and healthy arrival only. 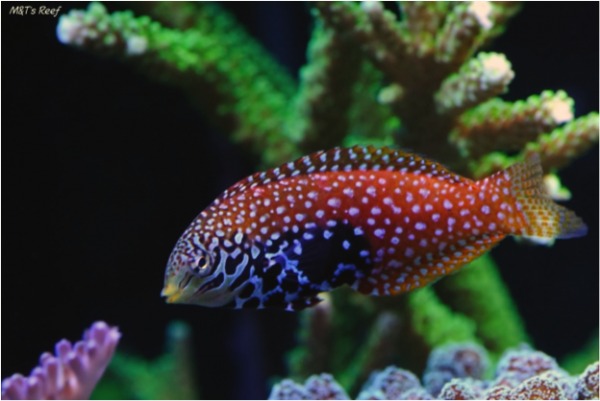 The Blue Star Leopard Wrasse diet should include frozen meaty foods such as enriched mysis shrimp, enriched brine shrimp, plankton, and Cyclop-eeze, as well as high-quality pellets and/or flake food. As previously mentioned, M. bipartitus will burrow under the sand bed to sleep at night and use it as a place of protection when startled or threatened. They will also sift through the top layer of sand in search of small worms, pods, and other small crustaceans. When first introduced to the aquarium, don’t be surprised to see your leopard wrasse dive into the sand and stay there for several hours, days or, in some cases, as long as two weeks or more. Be patient and allow the fish to come out when ready. Digging through the sand bed to find your leopard will only cause the fish undue stress. M. bipartitus can be kept singly, as a male/female pair, or in a large aquarium that has enough micro fauna to support them, as a harem made up of one male and two to three females. They may be kept with other peaceful, reef-safe wrasse genera such as Parachielinus and Cirrhilabrus, as well as some of the milder temperament species in the Halichoeres genus. It should be noted that wrasse species of the Pseudocheilinus genus can be quite aggressive toward other wrasse genera and keeping them with leopard wrasses (or any other peaceful wrasse genera) should only be considered with larger aquariums of several hundred gallons. Mixing leopard wrasses of differing species is possible, but should be approached with caution by the expert only. It should be noted that the larger the tank, the better your chance of a successful outcome. It should also be mentioned that M. kuiteri is considered semi-aggressive and may not mix well with other species of the genus. We have kept M. kuiteri with a M. bipartitus harem (one male, two females) with success in our 300-gal. 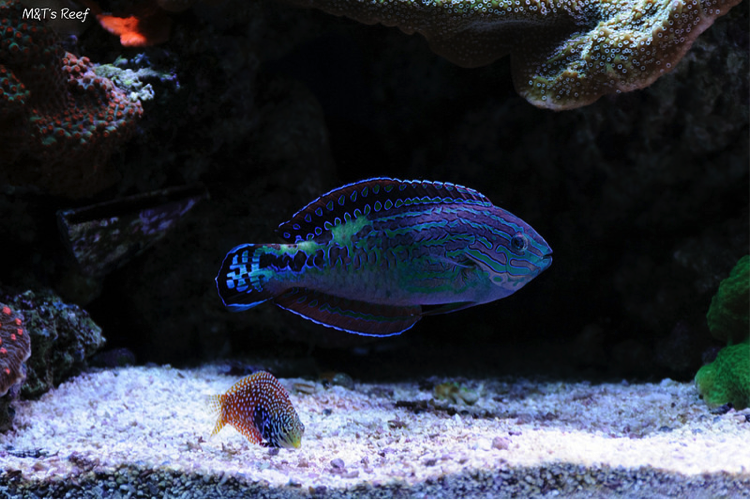 (1,136 liter) reef, but the M. bipartitus wrasses were well-established before introducing the female Kuiter’s Leopard Wrasse. A socialization/acclimation box is the best way to introduce new fish to your reef as it allows resident tank mates an opportunity to “meet and greet” the new addition without the risk of physical harm, and greatly reduces the chance of aggression once the new addition is released. As with all leopard wrasses, it can be a challenge to get M. bipartitus adapted to captivity and eating prepared foods which is why they should only be kept by experienced reef aquarists who can provide the proper environment and care needed for them to thrive. Once adapted, they are fairly easy to care for and can make a wonderful “Super Star” addition to an established, modern reef aquarium. Michael, S.W. 2009, “Wrasses & Parrotfishes,” Neptune City, NJ, 398 pp. Terry Lauderdale has been keeping marine aquariums since 1984. Their current system is a 300-gal. SPS-dominated reef that is home to a large variety of reef-safe fish. Their freelance writing and photographs have been published in several online and print magazine publications.